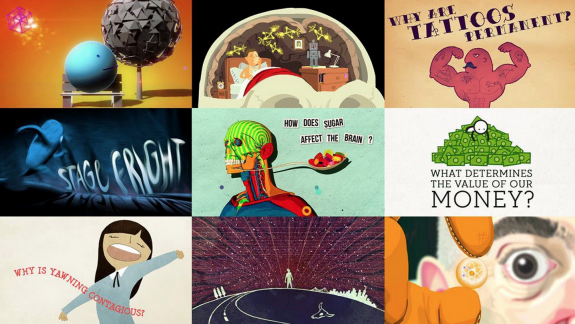 Videos like PBS Ideas, Vsauce and ours are designed to spark curiosity about ideas — from music to math to how sugar affects your brain. What ideas will you explore today? To inspire you, here’s an animated video playlist of the 5 most popular TED-Ed Lessons of all time. When you listen to music, multiple areas of your brain become engaged and active. But when you actually play an instrument, that activity becomes more like a full-body brain workout. What’s going on? Anita Collins explains the fireworks that go off in musicians’ brains when they play, and examines some of the long-term positive effects of this mental workout. Watch this TED-Ed Lesson below. When you eat something loaded with sugar, your taste buds, your gut and your brain all take notice. This activation of your reward system is not unlike how bodies process addictive substances such as alcohol or nicotine — an overload of sugar spikes dopamine levels and leaves you craving more. Nicole Avena explains why sweets and treats should be enjoyed in moderation. Watch this TED-Ed Lesson below. Physicist Werner Heisenberg said, “When I meet God, I am going to ask him two questions: why relativity? And why turbulence? I really believe he will have an answer for the first.” As difficult as turbulence is to understand mathematically, we can use art to depict the way it looks. Natalya St. Clair illustrates how Van Gogh captured this deep mystery of movement, fluid and light in his work. Watch this TED-Ed Lesson below. In one of the first TED-Ed animated videos, TED Curator Chris Anderson shares his boyhood obsession with quirky questions that seem to have no answers. Full version. Watch this TED-Ed Lesson below. Sometimes, against a uniform, bright background such as a clear sky or a blank computer screen, you might see things floating across your field of vision. What are these moving objects, and how are you seeing them? Michael Mauser explains the visual phenomenon that is floaters. Watch this TED-Ed Lesson below.